Am I Still an Evangelical? This is the question that I seem to be routinely asking myself: “Am I still an Evangelical?” Note that I did not say, “Am I still a Christian?” I still believe as passionately now as I first did now over 20 years ago. I can still wholeheartedly confess and affirm the Apostles’ Creed, the Nicene Creed, and the other major creeds. What I wrestle with now are some of the more non-esssentials that I once thought were part and parcel of the Christian faith. On top of this, I would include also the number of times that I have been accused of holding liberal views because I question the status quo or dare to read—and appreciate and find fruitful—books outside what appears to be the approved evangelical camp of authors, both past and present. I want to be clear, it is not that I have changed by mind regarding what I consider to be non-essentials; I probably still would say that I loosely hold to them. I just find myself wrestling with them more now than I did roughly 10 years or so ago. What I find disheartening is the questioning of one’s faith or accusations of liberalism. One’s commitment to Christ is not based on their view of inerrancy, evolution, women in ministry, or who they vote for or not. My commitment to Christ is based on my trust in his life, death, and resurrection. Everything else in a work in progress. The order in which the Synoptic Gospels were written has been debated now for well over 100 years. Early on, church fathers such as Papias, Jerome, and Augustine believed Matthew to be the first to write his gospel. Not until more recent times has this changed. Today most Gospel scholars hold to what is known as Marcan priority. This is the view I hold to; it is the view that I believe best explains all of the available evidence. But according to the guys over at the Cripplegate, I may need to rethink my view of the Synoptic Problem (and women in ministry, creation/evolution, authorship of the Pentateuch, [you fill in the blank]). According to the author of a recent post (How to Spot a Liberal Seminary) I run the risk of being associated with liberalism and the seminaries that promote such a teaching. Now, maybe I just do not get it or I am indeed under the influence of liberalism (if you read the comments here you may think I have succumbed to heresy), but last time I checked, we did not even know for certain who the authors of the Gospels even are? Sure, we have names attached to the titles in our English (and Greek) New Testaments, but I know of no one who can say with absolute certainty that they were part of the original autographs. My question is this: why does the author feel the need to accuse a seminary (or individual) of theological liberalism simply because one holds to Marcan priority? In what way does this distort or deny any of the main tenets of the faith we hold to? Did Matthew or Mark write first? This is another subtle, but critical signal of encroaching liberalism. All external evidence points to the Gospel According to Matthew was written before Mark or Luke wrote their accounts. This may not seem like a hill to get wounded on, but the only reason to assert that Mark wrote his gospel before Matthew is because “evolutionary theory” applied to the Bible allows that the more complex must necessarily come from the simpler, and assumes that the Evangelists cut-and-paste from each other instead of being guided by the Spirit to compose their accounts (2 Pet 1:21). Since Mark’s account is briefer, and most of his contents are also to be found in Matthew and Luke’s records, then the theory insists that Matthew and Luke were not led by the Spirit to write their accounts, but poached the bulk from Mark. This is illogical when you consider that Matthew was an intimate eye-witness as one of the twelve apostles. The fact that Mark and Matthew have similar content (in fact identical wording in places) is because it is the same Holy Spirit that inspired both accounts. Any seminary that is uncomfortable with that admission is not as committed to the doctrine of inspiration as they need to be. First, what does the author mean by “evolutionary theory,” and in what ways do the advocates of Marcan priority apply such a theory? If by evolutionary theory it is meant the changing of ones mind based on facts, well then I am guilty as charged. Further, where does he get this idea of a “cut-and-paste model?” We know that Luke himself used sources in the writing of his Gospel—both oral and written (Lk 1:1-4). No one who holds to Marcan priority, or at least none that I know of, describe this view as a form of cut-and-paste. This is an incorrect understanding of what Marcan priority is. I would ask that the author of this post provide some documentation to back up such an accusation. Again, when you make statements like: “Since Mark’s account is briefer, and most of his contents are also to be found in Matthew and Luke’s records, then the theory insists that Matthew and Luke were not led by the Spirit to write their accounts, but poached the bulk from Mark,” and you provide no supporting documentation, I must again assume that you are more comfortable burning down straw men than you are with actually looking at the evidence. You are correct in saying that Matthew was an intimate eyewitness to the words and deeds of Jesus, but I ask: can you say with complete certainty that Matthew was the author of the gospel of Matthew? And if tradition is correct about Mark’s close relationship with Peter, I would argue he would have an even more intimate relationship, seeing that Peter was one of the four apostles who was closest to Jesus. But it is the last sentence that I just cannot fathom! How can the author of this post stand in judgment over a seminary (or person) and accuse them of not being “committed to the doctrine of inspiration as they need to be?” This statement is nothing more than spiritual hubris! How dare you accuse me sir of not being committed to the doctrine of inspiration! You do not know my convictions or beliefs. By what authority do you stand in judgment over those who do not hold to every jot and title of matters that have no bearing on the faith that was once for all delivered to the saints? Do you not see how a post like this hurts more than it helps? Before you accuse me of being one of those who went to a liberal seminary, please know that I come from the same camps as you do; I was educated at the same institutions you were, sat under the same preachers you did, and still hold to the same faith you do. I am not a liberal, even if I read those whom you deem to be so! When all is said and done, we will stand at the throne of God and praise him for what he has done. I look forward to the day when I will stand with you, proclaiming with you that our God reigns. If you know me, you know two things: First, I love the Epistle to the Hebrews. And second, you probably know more about Ceslas Spicq’s L’Épitre aux Hébreux (The Epistle to the Hebrews) than you care too. Well, to say that I am excited about what I am about to say would be an understatement. I am pleased to announce that my awesome employer, Logos Bible Software, is looking to publish the first ever English edition of Ceslas Spicq’s magisterial commentary. Yes, you read that right! Now, everyone I have ever talked to death about this work—how awesome it is, how it needs to be translated, how I am going to do whatever I can to get it translated—can rest assured that I will not talk about it…as much. My love for this great French scholar began back during my undergraduate days. I was beginning my love for all things Epistle to the Hebrews. It the last semester of my major, Greek, that I took exegesis of the Epistle to the Hebrews. I was loving life and enjoying my critical study of the Greek text. I checked out every major commentary the library had on Hebrews (my classmates were not too thrilled, to say the least), and I began to work through them and I kept running into one name over and over. Can you guess who this was? Indeed, it was Mr. Spicq. Now, I tried desperately to track down a copy, but there were none to be found. Anywhere! This was frustrating me because every major commentator on Hebrews interacted with Spicq, and I wanted to see what made this man so vital that he was worthy of interacting with. I soon came to find out that not only was Spicq’s commentary impossible to find, it also was not in print (I think it may have only been published the initial time in 1952-53) or translated into English. For a budding Hebrews scholar and bibliophile, this is simply unacceptable! I made it my mission in 2006 to see to it that there would be an English edition for the world to enjoy. A few years back a good friend and I decided that we could not sit around and wait to see an English edition of Spicq. So, we jumped into our cars and headed down to Pasadena, to Archive’s Bookstore. The owner of the bookstore also owns a publishing house that specializes in re-prints of classic works. We had a good converstaion with him, pleading our case as to why Spicq needed to be re-published and translated. We left there with a promise that he would do what he could to make this happen. Well, weeks turned into months and I heard nothing from the owner of the bookstore. During that time I also tried to contact the publisher and inquire about rights, permissions, etc. I never once got a reply. Well, we finally heard back from the owner of the bookstore and he said that he tried to get in touch with the publisher, but they never returned their message. So, the dream was dead. I figured if Archives could not make this happen, it will never come to pass. Flash-forward now to 2012. With the help of two wonderfully kind gentlemen—Father Benedict Viviano and Rev Dr Jerome Murphy-O’Connor—this time I was able to get in touch with the French Publisher Gabalda and get permission to do an English translation of Spicq. This has been a dream of mine for a number of years. I must say, Logos has been awesome to let me go out and make this dream a reality. They supported my efforts and shared my desire to see Ceslas Spicq’s work translated and shared with the world. Now, all that you need to do is head over to Logos and get your order your in today. By placing your Pre-Pub order, you are holding your place in line. You are not charged a dime until the book is published and shipped to you electronically. So what are you waiting for? Go to Logos now and make my dream a reality. Before I finish, go check out my post on the Logos Blog. It will give you my “apologetic” for Ceslas Spicq’s L’Épitre aux Hébreux. Update: This is the week of blessing for me. After years of searching the internet, trying hard to find a copy of vol 2 of L’Épitre aux Hébreux, I can say now that my journey has ended! I have finally have the complete set of of Ceslas Spicq’s L’Épitre aux Hébreux. Now I will look for his Esquisse d’une Histoire de l’Exégèse Latine au Moyen Age. Well, I have officially arrived in my new home of Bellingham. First impressions: green, clean and crisp! I enjoy having trees surrounding me and breathing in crisp, clean air. My apartment is directly behind where I will be working, so the walk is a miserable 30 second jaunt. I have been staying with my best friend and his family in Mt. Vernon the last few days while I get adjusted to Washingtonian life. I am eager to begin work. Having worked the last 4 years non-stop, these last few weeks of not working have been boring. I do not like having a lot of free time, so I have been reading mainly a biography on F.F. Bruce. I am looking forward to getting into a new routine of work and living, but it will not be complete until I have my amazing wife with me here. Well, I am off for now, but look I will be back more regularly in the coming days. I have been busy these last few weeks. I am packing up my life here in California to take it all north to the town of Bellingham, Washington in order to begin a job with Logos Bible Software. I am very grateful to have been given this opportunity to work for a company that I love. This is a very exciting time in my life, and one which I have struggled to attain for quite sometime. The last ten or so years have been filled with many ups and downs, sadly more downs than ups. But the Lord has been faithful and has never left me to pick up the pieces on my own. Every heartbreak and dissappointment has led me to this place and to Washington. I have seen the way the Lord has orchestrated his plan and seen his hand move in powerful ways. I am so very humbled by his grace and faithfulness! He has provided me with more than I can every ask for or think of. May he continue to bless the path that he has set before me and my wife. It will be hard to leave the town I have known since birth. I have lived here in southern California all of my life; it is all that I have ever known. I have moved a few times, but only in a radius of a few miles at most. One thing that I have found out is that I do not take change well, so I ask for prayer for a fast adjustment. Sadly my wife will not be able to join me right away, but she will soon. This will be hard for us both, so I ask for prayer for her as she adjusts to life apart for a season. Pray that she can secure a job fast and move up and join me in Washington. Until she arrives I will have the company of one of my best friends and his family. It will be so good to be able to go on a milkshake run like we use to in college. He is a good friend and a dear brother in the Lord. Well, that is all for now. I will begin posting more regularly once I a settled into my new job and home in Washington. PS – If you are ever in Bellingham look me up; coffee is on me! I suppose it was his name that first caught my attention. I was a young Christian who was just given a wealth of books from the library of a friend. One of the books that I was given was a commentary on the Gospel of John. While skimming through it I noticed the amount of detail and precision that filled the pages. Although at the time I knew not a lick of Greek, I nevertheless appreciated the amount of detail that the author went into. That author was the great New Testament exegete, Charles Kingsley Barrett. I suppose it is safe to say that C. K. Barrett was one of the main reasons why I not only majored in Greek, but he is also a major influence in regards to academic discipline and rigor. His commentary on John was the gateway for me into the world of academic studies. As I started to branch out into the world of critical studies, Barrett was a helpful guide, pointing me in the direction of many standard academic tomes. As the world of critical scholarship began to open its illustrious doors, I soon began to see the name Barrett around every corner. Not only was Barrett a Johannine scholar, I soon realized that he was trained in classics, and had is hand in almost every scholastic cookie jar in New Testament studies. So, as the years passed I began to acquire as many of his writings as I could. One work in particular comes to mind. While in college I ran across a reference to a festschrift written honor of Barrett entitled “Paul and Paulinism.” I immediately searched the web for a copy of is work. Not only did I discover it was out of print, but used copies at that time would cost me well over a hundred dollars. Being the starving college student that I was, I sadly had to pass it by. Now flash forward a few years, and a random search of Amazon reveals a copy for the staggering price of $20. Still the starving college student that I am, I could nevertheless pass it by this time. You can imagine my sadness as I read earlier this morning that Charles Kingsley Barrett passed from this life to glory. He was 94 years old (1917-2011). He spent his career teaching in university of Durham as professor of divinity, retiring in 1982. Barrett was also heavily involved in the Methodist church in England. Some of his works included a two-volume commentary on Acts, commentaries on 1 Corinthians, Romans, articles on the eschatology in Hebrews, Acts, John, and a myriad of other works. So, today I encourage you to pick up a Barrett book or article and read with me the work of a brilliant New Testament exegete. I was reading this afternoon the account of Jesus before both Pilate and Herod in Luke’s gospel (Lk 23.1-25). What caught my attention as I was reading was the two different responses these men had while Jesus was standing in their presence. One, Pilate, responded in a political manner. He was far more concerned with keeping the peace-and his job-than he was with justice. Because he feared that the Jewish leaders and their followers would riot if they did not receive the judicial outcome they so lusted after, he gave into their blood-thirst and had Jesus traded for (ironically) a man guilty of insurrection and murder. Jesus was to be crucified all because Pilate did not have the spine to stand up to a people under his own authority. On the other hand, Herod was far more interested in the miracle worker that he heard so much about. He cared far less for the accusations and charges that were levied against Jesus. All he wanted was for Jesus to put on a show and entertain him. 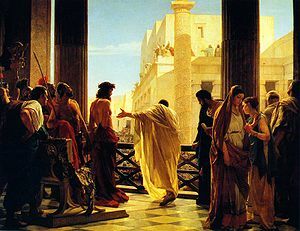 So when Jesus refused to entertain Herod’s childish request, Herod had him humiliated and mocked and sent back to Pilate to face his accusers one last time. The responses by Herod and Pilate to Jesus is no different then as it is today. Many people refuse to submit to the sovereignty of Christ because he threatens their way of life. To turn to Christ is to turn from the accolades of this world. Others, instead of turning from Christ turn to him for a religious high or religious experience. One has to look no further than the television to see men supposedly casting out demons and healing people’s headaches or whatnot. These people will follow Jesus when they feel a religious high or experience. But the instant things go south, and life begins to bring trials into their lives they are gone like the wind. The true followers of Christ follow him to the cross. They cling to him when things are good and when life is a living hell on earth. They know that they have left everything to follow Jesus, and they will follow him to death if necessary. So I ask myself: What kind of follower am I?